A small table. A deck of cards. And fifteen of your closest friends or associates. Whether a demonstration of sophisticated gambling techniques or a presentation of impossible illusions, Steve Goldstein's formal, 50-minute close-up shows are designed to offer your guests—anywhere in the San Francisco Bay Area—an evening of card table entertainment they have likely never seen before. ♣ The current show, for 2019, is called CHEATERS, and showcases the various deceptions that con men use to earn their living at the card table. 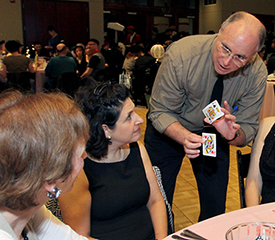 Where engagements involve larger audiences, Steve performs walkaround magic during a cocktail hour or dinner party event that connects guests in small groups, inviting them into the performance to take part in the illusions.